This unforgettable, adorable little bottom slowly entering the world shows the miracle of a gentle c-section breech birth. 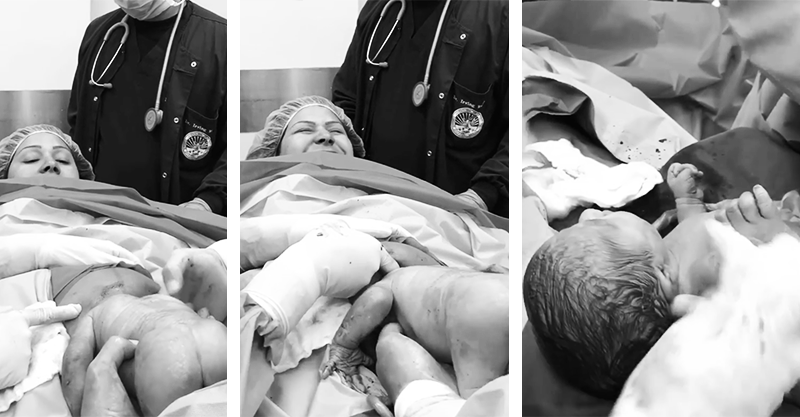 An amazing clip of a “gentle” bottom-first c-section is going viral for good reason, capturing a very rarely seen miracle moment in gorgeous-yet-heart-stopping style. This birth was assisted by a doula and the bub’s dad, with a focus on keeping things as gentle as possible, despite the surgical intervention. While a breech birth has its challenges, this team worked to ensure this baby was delivered as slowly and lovingly as possible. The birth was carefully planned and aimed to avoid the speedy, efficient approach of many c-section procedures. Instead, they played music, calmed things down, eased the baby into the world, delayed the clamping of the cord and ensured mother and baby were united immediately, post-delivery. “One of the usual causes for a planned cesarean section is the position (presentation) podalica (sitting or buttocks) that is when the baby is placed with the feet down. It is a position that undoubtedly presents major problems for vaginal birth, but nevertheless, it does not prevent it. What a privilege to catch an intimate glimpse into this family’s special moment.